We are writing to you today to invite you to apply for a grant from Save the Harbor/Save the Bay’s Better Beaches Program to support free events and activities on the Boston Harbor Region’s public beaches in 2017. Last year, with the support of the Metropolitan Beaches Commission and the Department of Conservation and Recreation (DCR), we awarded more than $200,000 in grants to 43 organizations in nine waterfront neighborhoods and beachfront communities to support 107 free beach events and programs, which brought more than 500,000 people back to their beaches in 2016. Though the most recent round of budget cuts will likely prevent DCR from investing in the program this year as they did in 2015 and 2016, Save the Harbor/Save the Bay remains committed to supporting another full season of free Better Beaches events and programs on the region’s public beaches in Lynn, Nahant, Revere, Winthrop, East Boston, South Boston, Dorchester, Quincy and Hull. Despite the cuts, there is some very good news. 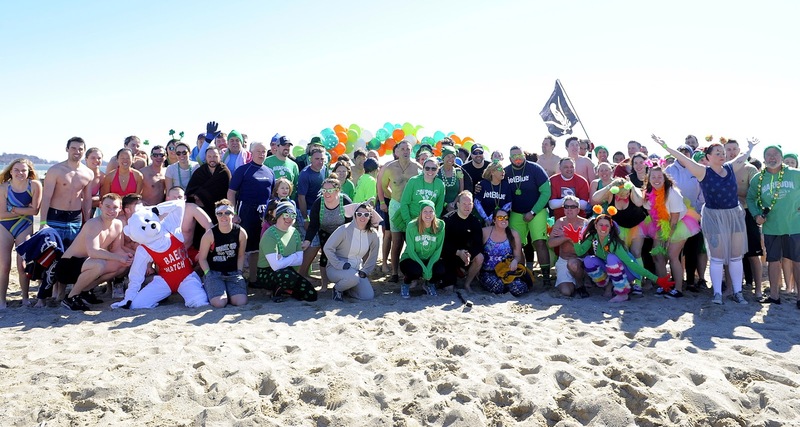 On Sunday, March 5th hundreds of beach-lovers braved record cold and raised a record $55,755 at the Harpoon Shamrock Splash to fund our Better Beaches Program this summer. As a result of their hard work and the support of our foundation funding partners, corporate sponsors, and more than 800 “Splashers” and small donors, we will be funding another season of free beach events and programs that are as diverse as the beachfront communities and waterfront neighborhoods that host them. This year’s Better Beaches Program Grants will range from $500 - $5,000 to support free events and programs that include concert series, sand- sculpting competitions, campfires, Art on the Shore, Storytelling by the Sea, neighborhood beach parties, family reading and movie nights on the beach, youth programs and much more. You can learn more about events and programs we supported last year by downloading our 2016 Better Beaches Program Report at www.savetheharbor.org/Content/2016BeachReport.pdf. Also, we thought you might find this video that we produced in 2015 helpful! www.savetheharbor.org/Content/Spectacular_Summer/. 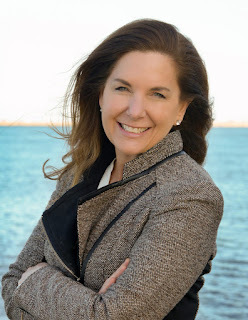 All of these great events have one thing in common: They bring people together to strengthen their communities and enjoy our region's most stunning natural resources, the 19 miles of public swimming beaches that connect us to each other and to Boston Harbor, Mass Bay and Broad Sound. It is easy to apply for a grant. Just fill out the attached application and return it to us by email to info@savetheharbor.org by April 18, 2017. Our Better Beaches Grants Committee will review the proposals, and notify you of our decisions in May. We will present the checks at our annual BETTER BEACHES AWARD RECEPTION on Saturday, June 3, 2017 on Boston’s Fish Pier at 10:00 am, which all grant recipients are expected to attend. Please note that if you receive a grant, you must complete a DCR Better Beaches Program Special Use Permit Application before you receive your check on June 3. You will also be required to display a Better Beaches Program banner at your event., which we will provide, acknowledging Save the Harbor’s support. You must also send us a thank-you letter acknowledging your grant and a simple closeout report after your event, along with copies of event materials, photographs and news clips. Save the Harbor would like to thank the Metropolitan Beaches Commission, the Department of Conservation and Recreation and the more than 800 people who made pledges in support of the 2017 Harpoon Shamrock Splash. Thanks as well to Save the Harbor's Better Beaches program and policy partners and event sponsors: Harpoon Brewery, JetBlue, The Boston Foundation, Harold Whitworth Pierce Charitable Trust, Richard Saltonstall Charitable Foundation, P&G Gillette, National Grid, Comcast, Google, B. Good, Keezer Sportswear, Mix 104.1 & AMP 103.3, Boston Centers for Youth & Families, and the YMCA of Greater Boston for their support. Please feel free to distribute this Request for Proposals widely, and to contact Bruce Berman by email at bruce@bostonharbor.com or on his cell at 617-293-6243 with any questions about the Better Beaches Program or your request. We look forward to hearing from you about your ideas for 2017. 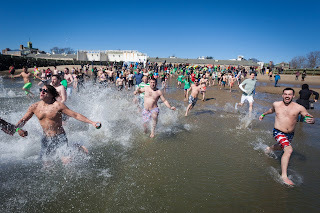 On March 5, over 250 brave beach lovers plunged into Boston Harbor at the BCYF Curley Community Center in South Boston in record-breaking cold temperatures as part of the Harpoon Shamrock Splash to benefit Save the Harbor/Save the Bay. Bridget Ryan, a BPS teacher and South Boston resident, takes the plunge for the 6th year in a row, raising $1365 for South Boston's beaches as part of this year's Harpoon Shamrock Splash. Splashers raised $7000 to support free beach events and programs on South Boston beaches this summer. This year, the “pledge and plunge” fundraiser raised over $50,000, crushing 2016’s fundraising record. All proceeds from the event supports Save the Harbor/Save the Bay’s Better Beaches Program, which every year provides a spectacular summer of free concerts and beach festivals, sand sculpting competitions, and youth programs on the region's public beaches in Lynn, Nahant, Revere, Winthrop, East Boston, South Boston, Dorchester, Quincy and Hull. You can find the exact tally at the event website at www.shamrocksplash.org. This year’s Harpoon Shamrock Splash was the best ever, with post-plunge Harpoon beers and b.good burgers while Mix 104.1 and AMP 103.3 played hit music. After the event, participants went home to warm up with great Harpoon swag for reaching fundraising goals, and roundtrip JetBlue flights for the biggest fundraisers, and for those who showed up in the best costumes. All splashers and contributors had the opportunity to win in two post-splash JetBlue flight raffles. 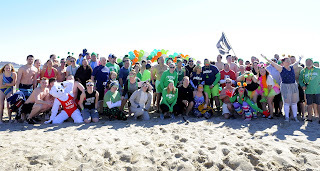 This year’s Harpoon Shamrock Splash was also the most important ever, with deep cuts to the metropolitan beaches budget this year, every dollar raised goes straight to help fund another great summer of free events and youth programs on our public beaches from Nahant to Nantasket. More than 250 splashers get together for a photo in 20 degree weather before dashing to the water’s edge and taking the plunge in the clean, cold water of Boston Harbor. "Despite the budget cuts, Save the Harbor is committed to funding a full season of free beach events and programs this summer" said Bruce Berman, Director of Strategy and Communications at Save the Harbor/Save the Bay. "All of us froze our fannies off at the Harpoon Shamrock Splash to make it happen." Save the Harbor/Save the Bay's plans to #savethesummer have just begun. This month they will issue a Request for Proposals for their 2016 Better Beaches grant program, which funded 40 great events on the region’s public beaches in 2016. You can read about the impact the cuts will have on beaches in Lynn, Nahant, Revere, Winthrop, East Boston, South Boston, Dorchester, Quincy and Hull on their blog, and how you can help at http://www.blog.savetheharbor.org. 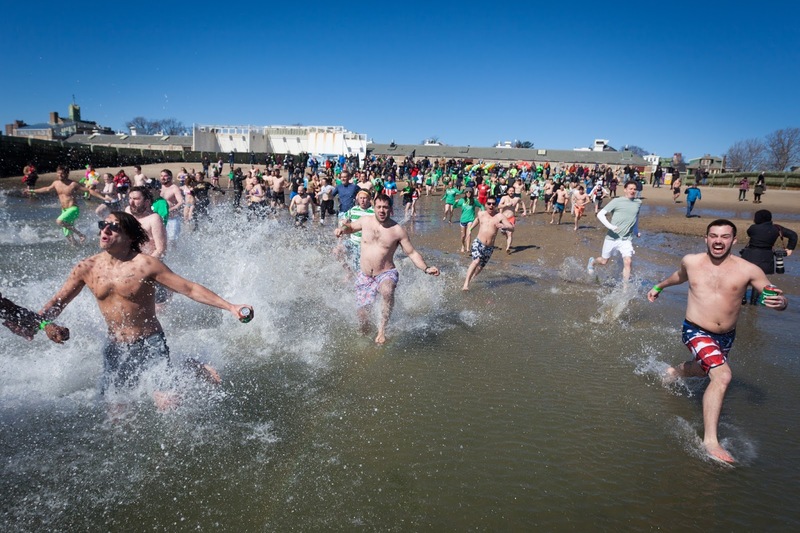 Record breaking cold couldn’t stop these beach-lovers from splashing Sunday to raise a record breaking $52,0000 to support free beach events and programs on their favorite beaches in 2017. Thanks to the Metropolitan Beaches Commission, the Department of Conservation and Recreation and the more than 700 people who made pledges in support of the 2017 Harpoon Shamrock Splash. Thanks as well to Save the Harbor's Better Beaches program and policy partners and event sponsors at Harpoon Brewery, JetBlue, b.good, Keezer Sportswear, The Boston Foundation, Harold Whitworth Pierce Charitable Trust, Richard Saltonstall Charitable Foundation, MarineMax Russo, P&G Gillette, National Grid, Comcast, Google, Mix 104.1, AMP 103.3 and Boston Centers for Youth & Families, Sullivan's Castle Island and the YMCA of Greater Boston for their support. Over the past 8 years, Save the Harbor's community partners in Nahant, Lynn, Revere, Winthrop, East Boston, South Boston, Dorchester, Quincy and Hull have leveraged $628,700 in small grants received from Save the Harbor/Save the Bay with $1,918,065 in cash and in-kind contributions from local government and small businesses for a total investment of $2,504,725 in 391 free events and programs for the region’s residents and visitors alike. In 2016, with the support of Save the Harbor’s foundation funders, program partners, the Department of Conservation and Recreation and hundreds of volunteers, the Better Beaches Program awarded $219,442 in small grants and organizational support to 43 groups in 9 beachfront communities and waterfront neighborhoods. In turn, these groups leveraged those funds to support 107 free concerts, fitness boot-camps, beach festivals, sand raking demonstrations and sand sculpting competitions. For more information about Save the Harbor/Save the Bay and the work they do to restore, protect and share Boston Harbor, the Boston Harbor Islands and our region's public beaches, visit their website at www.savetheharbor.org, their blog "Sea, Sand & Sky" at blog.savetheharbor.org, or follow savetheharbor on Facebook, Twitter and Instagram.